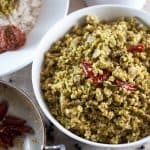 Kerala style cabbage stir fry with coconut, ginger-garlic and green chilly. 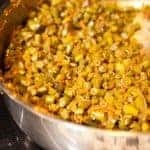 Cabbage thoran is one of the side dishes for Kerala Onam Sadya and very common at a Kerala home. 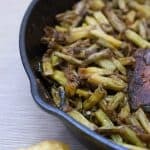 A simple and healthy side dish that goes well with rice. It’s also called as “cabbage upperi” in the central part of Kerala. 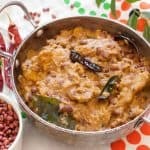 If you are interested in other thoran recipe, here’s beans thoran recipe. Remove the thick fibrous outer leaves and wash cabbage under running water. Shred the cabbage into thin pieces or chop the cabbage into small pieces. I like to chop cabbage in my chopper, which makes it very small. Chopping is much easier and it gets cooked very fast. It tastes yummy too. 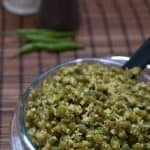 In a chopper or mixi, crush green chilly well. Then add coconut. Crush (or pulse) it to blend everything well. ** Don't grind and don't add water. Mix it with chopped cabbage well and keep it aside. Chop shallots. Heat oil in a pan. Splutter mustard seeds and then add curry leaves. Add shallots, crushed ginger, and garlic. Saute it until soft and translucent. Add turmeric powder and saute it. Then add chopped cabbage and coconut mixture and enough salt. Don't add water. It naturally has water in it, which releases while it gets cooked. Don't close the pan. Cook it until water evaporates, and cabbage is done. Adjust salt as needed. Serve with rice ? Coconut is the key ingredient in this recipe. Never compromise on that.